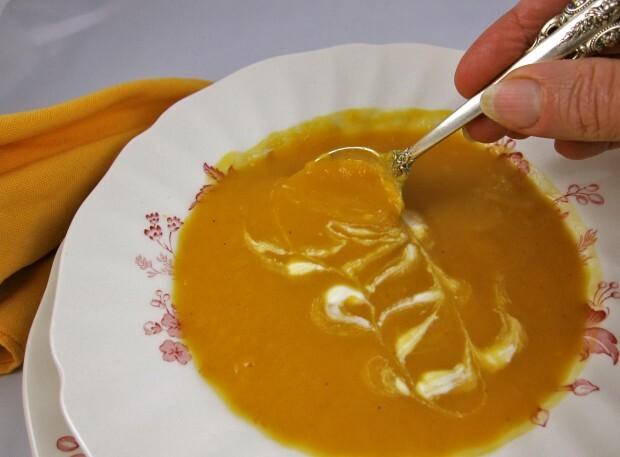 This soup is the quintessential taste of fall, the sweetness of the pears delicately balancing the subtle earthiness of the sweet potato. The sweet potato and pear are both in the peak of season now, their natural flavors enhancing each other beautifully. Sweet potatoes, native to Central America, are one of the oldest vegetables known to man. They have a starchy sweet taste with different varieties unique flavor profiles. Rich in beta-carotene, sweet potatoes are loaded with powerful antioxidant protection against damage to cellular structures and DNA. In American grocery potato bins, the name yam and sweet potatoes are often used interchangeably, but the two are biologically unrelated plants. The main distinguishing factor between a sweet potato and a yam is a sweet potato generally has ends which taper to a point and yams tend to have rough scaly skin. The majority you’ll find in our town are varieties of orange sweet potatoes. Melt butter and sauté leeks in a large pot for 5 minutes. Add sweet potatoes, pears and stock. Bring to a boil over medium heat. 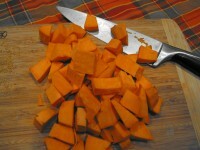 Reduce heat and simmer until the sweet potatoes are tender, about 40 minutes. Add the allspice or nutmeg. Purée the hot mixture in the pot with an immersion blender or in a food processor. Ladle the soup into bowls. To garnish, if desired, dip the flat part of a tooth pick into the crème fraîche and swirl a design onto the soup. Serve immediately. *Crème fraîche can be made by whisking 2 tablespoons of heavy cream with 2 tablespoons of sour cream. Pour the mixture into a jar, cover and let stand in a warm place for 24 hours. Stir and refrigerate. Will keep 2-3 weeks, refrigerated.